Size: Up to 60 feet or more (90'), usually much less. Growth Form: Tree, shrub; fast growing, trunk diameter 30 inches, mature bark brown, thick, rough and with deep furrows (see photo); twigs yellowish, fine hairs become glabrous. Leaves: Green, light green; deciduous, leaves large, 2 to 4 inches or so; narrowly lanceolate, narrowly elliptic or narrowly ovate, petioles have glands at base; margins serrate. Flowering Season: March to April. Elevation: Up to 7,000 feet; lower elevations in California, often below 1,500 feet. 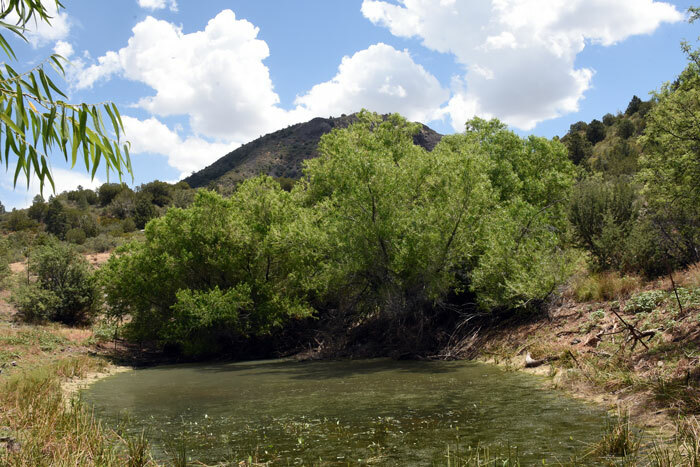 Habitat Preferences: Riparian areas; rivers, streams, marshes, washes, creeks, stock tanks and seeps or moist areas; often dominate species or co-dominate with Fremont Cottonwood. 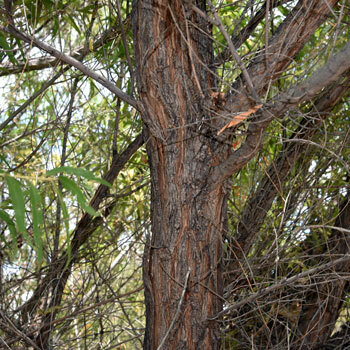 Recorded Range: Goodding's Willow is found in the southwest United States in AZ, CA, NM, NV, TX, UT. It is also found in Baja California and northern Mexico. In Arizona is occurs throughout the state. North America & US County Distribution Map for Salix gooddingii. Wetland Indicator: No information available. In North America Salix gooddingii has the following wetland designations: Arid West, FACW; Great Plains, FACW; Western Mountains, Valleys, and Coast, FACW. 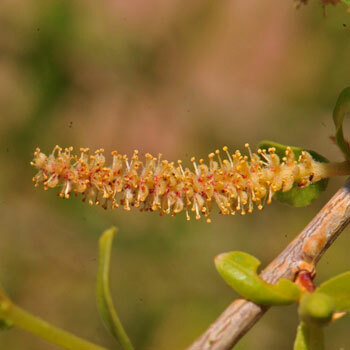 Genus Information: In North America there are 171 species and 200 accepted taxa overall for Salix. 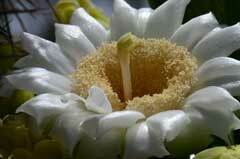 Worldwide, The Plant List includes 552 accepted species names with 963 infraspecific rank for the genus. In the Southwestern United States, Arizona has 19 species of Salix, California has 30 species, Nevada has 23 species, New Mexico has 24 species, Texas has 8 species and Utah has 27 species. All data is approximate and subject to taxonomic changes. Comments: Salix gooddingii, or Goodding's Willow is found in a variety of habitats including desert shrub, chaparral and pinyon juniper. This species as with other dominant riparian species, provides important shade in dry desert and upland areas. Goodding's Willow also provides browse, cover and food for insects and wildlife especially beavers. 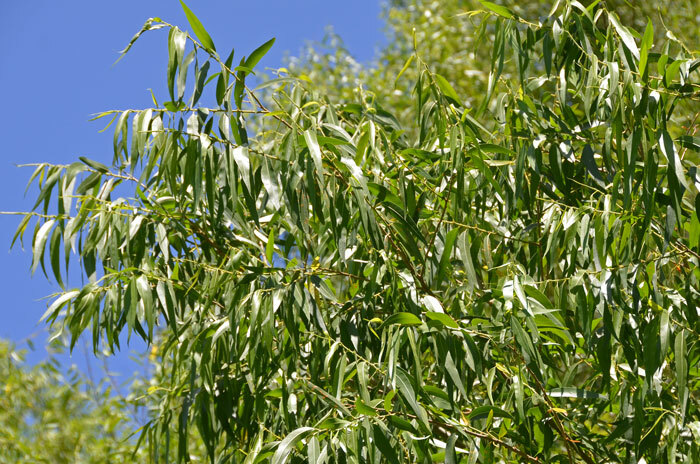 For a comprehensive thoroughly documented review of Goodding's Willow, Salix gooddingii see the USDA USFS Fire Effects Information System, or FEIS. Goodding's Willow is common in southwestern United States deserts where it is found along streams commonly with Arizona Walnut (Juglans major), Fremont Cottonwood (Populus fremontii) and Arizona Sycamore (Platanus wrightii). In Southwest Desert Flora also see Narrowleaf Willow, Salix exigua. 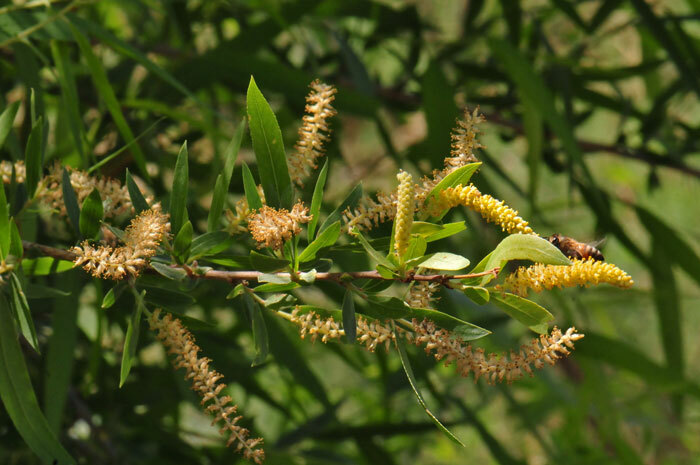 Salix gooddingii, Goodding's Willow has been used as a beverage and for a variety of other purposes by South American indigenous peoples. Cahuilla Fiber, Furniture, Wood used to make cradle boards. Mohave Food, Beverage, Young shoots used to make tea. Pima Drug, Febrifuge, Decoction of leaves and bark taken as a febrifuge. Pima Fiber, Basketry, Used as foundations for outdoor storage baskets. Pima Fiber, Mats, Rugs & Bedding, Bark used as padding in baby cradles. Pima Fiber, Sewing Material, Small, green branches split in two, peeled, twisted, dried and used for sewing coiled baskets. Pima Food, Unspecified, Catkins eaten raw. Pima Other, Hunting & Fishing Item, Used to make bows. Yuma Food, Beverage, Leaves and twig bark steeped to make tea. Yuma Food, Unspecified, Bark eaten raw or cooked in hot ashes. See all ethno-botanical uses at Native American Ethnobotany, University of Michigan, Dearborn. Reed, William R. 1993. Salix gooddingii In: Fire Effects Information System, [Online]. U.S. Department of Agriculture, Forest Service, Rocky Mountain Research Station, Fire Sciences Laboratory (Producer). Available: http://www.fs.fed.us/database/feis/ [2016, July 29]. The Plant List (2013). Version 1.1. Published on the Internet; http://www.theplantlist.org/ (accessed 07/28/2016). Native Plant Information Network, NPIN (2013). Published on the Internet http://www.wildflower.org/plants/ [accessed: 07/28/2016]. Lady Bird Johnson Wildflower Center at The University of Texas, Austin, TX.